Welcome to one of the best times of the year: a time of year when we get to spend time with our friends and family, reflect on the past year, and plan for what’s to come. This is meant to be a time of year to rest and recuperate and we hope it truly is that for you. However, should you at anytime have the unfortunate accident of locking yourself out of your car, house, or apartment, we’re here for you. Even Christmas morning, we’ll be here to send someone your way. We’re dedicated to being available 24/7, and that includes some of the biggest holidays. 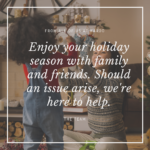 So please, enjoy your time with your family and we hope you don’t have to call us. But if you do, we look forward to getting you out of your jam as quick as possible!